UofL is committed to reducing our net greenhouse gas emissions and achieving climate neutrality by 2050. In 2008, UofL became a signatory to the American College & University Presidents’ Climate Commitment, which is now known simply as the Carbon Commitment. As a member of the Climate Leadership Network, the University of Louisville is committed to reducing greenhouse gas (GHG) emissions with the ultimate goal of achieving carbon neutrality by 2050 at the latest. 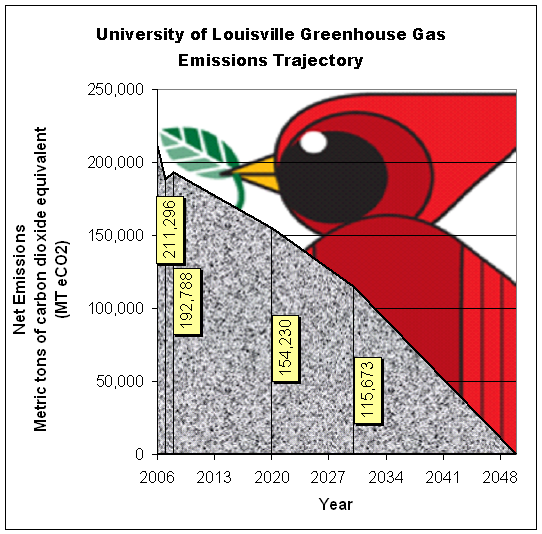 After benchmarking our carbon footprint with our 2008 Greenhouse Gas Emissions Baseline Inventory, on September 15, 2010, UofL released its Climate Action Plan, a comprehensive roadmap for reducing our emissions down to net zero. A summary of the Plan and a link to the full document can be found here. The Sustainability Council coordinates UofL's Climate Action Planning as well as the reporting of our greenhouse gas emissions. Our efforts to implement our Climate Action Plan had been paying off for many years, as we made progress toward our goal of climate neutrality. However, on May 1, 2018, UofL released its 2017 Greenhouse Gas Emissions Report, which documents that, following significant improvement in 2016, our emissions actually increased 11% in 2017, knocking us off track from achieving our first milestone goal of a 20% emissions reduction by 2020 from our 2008 baseline. In 2016, we stood at an 18.69% reduction from the 2008 baseline. In 2017, we are back down to a 13.51% reduction. We must cut emissions another 6.5% to achieve our goal of a 20% reduction by 2020. This is a troubling development, but it is not unfamiliar territory for UofL. We have been here before and we have righted our ship before. We saw a similar increase in emissions from 2013 to 2015, and took action to reverse the trend. In 2016, by continuing to invest in efficiency and behavior change, the university was able to achieve a 7.2% reduction of carbon emissions in one year. This was a vital investment for the sake of our students’ futures, and, indeed, for our common future on this one shared planet. Our efforts to implement our Climate Action Plan (CAP) had been paying off, thanks to sustained investment of resources and attention in fiscal years 2011-2017. However, a troubling reversal of progress occurred in the last year during which the university’s financial crisis resulted in a 100% budget cut for Climate Action Plan implementation. A renewed investment of resources and leadership can get us back on track in the years to come. 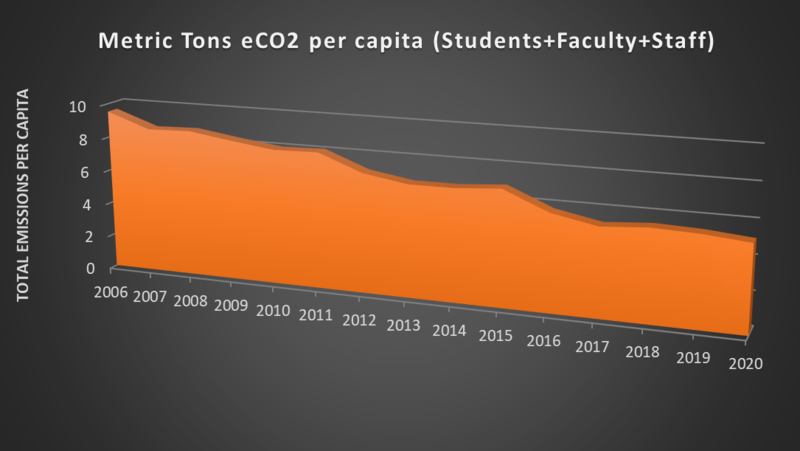 Fortunately, over the long-term, we have reduced our greenhouse gas (GHG) emissions, even as we continue to grow in terms of physical size, campus population, and budgetary expenditures. From 2006 to 2017, we estimate that UofL’s net carbon emissions have declined nearly 20% from 236,101 to 189,022 metric tons/year. Yet this is no time to rest on our laurels. In fact, the most important finding of this inventory is that renewed investment will be required to make further progress and to meet our targets. Given that the social cost of carbon is at least $40/ton of carbon emissions, UofL's emissions in 2017 were still responsible for no less than $7.56 million/year in damage to our planet and its people. It is not acceptable to continue externalizing these costs and imposing such a debt on the future generations for whom UofL ought to be a source of hope and flourishing. Carbon sequestered by 34,768 acres of U.S. forests in one year (or 764,993 tree seedlings grown for 10 years). While this reduction is important and laudable, this is no time for complacency. We must remain vigilant, committed, and willing to invest resources in order maintain our progress and to ensure a sustained effort toward our ultimate goal of climate neutrality by 2050. We must continue to invest in emissions reduction, to innovate solutions that work in our unique urban setting, and to prioritize efficiency, behavior change, transportation alternatives and renewable energy. Reduce driving through a Transportation Demand Management Plan that invests in and incentivizes alternatives, caps parking, & transitions UofL from highly subsidized annual permits to market-rate, pay-per-use parking. Invest in large-scale renewable energy, behavior change, and energy efficiency measures beyond the scope of the existing performance contract. Explore carbon offsetting and sequestration solutions that would benefit our campus, community, and region. The reductions we’ve been able to achieve over the years have occurred in spite of the continued growth of our university in terms of budget, employees, students, land, and building space. We've documented reductions across the board in terms of emissions per student, per capita, per square foot of building space, and per dollar of operating budget. UofL has been on a bit of a roller coaster ride as we try to reduce our carbon footprint. Though our 2017 Report documents a sharp increase in emissions, our 2016 Greenhouse Gas Emissions Report, showed an encouraging decline following the two-year rise in emission documented in our 2015 Greenhouse Gas Emissions Inventory. That bad news, however, came on the heels of a very encouraging 2013 Greenhouse Gas Emissions Inventory, in which we estimated that emissions had dropped over 22% from 2006 to 2013 (from 246,929 to 191,823 metric tons of carbon dioxide equivalent emitted annually, an amount equal to taking 11,600 cars off the road). While the reductions to date are certainly worthy of note and should be celebrated, they still do not represent a steep enough decline to achieve our goal of climate neutrality by 2050. We must continue to innovate and strive for even greater reductions in years to come. Our plan for making progress toward climate neutrality is dynamic and multifaceted. We recognize that sustainability demands progress on multiple fronts and that lasting change cannot be achieved without coordinated efforts campus-wide. As such, we propose taking a variety of steps to lead UofL down a path toward climate neutrality with a focus on the following initiatives: green purchasing; energy conservation and efficiency; renewable energy; carbon sequestration; master planning; green building design; composting and horticultural practices; behavior change; recycling; transportation; food; and carbon offsets. UofL employees & students are encouraged to offset emissions from university travel/business through a service such as Carbon Footprint Ltd, Native Energy, CarbonFund, or TerraPass. UofL's Climate Action Plan is designed to be a living document that we will continue to revisit and refine as we go through a four decade process of adaptive management on the road to climate neutrality. Engaging students, faculty, researchers, staff and the broader community in this process will be vital to its success and to our broader educational and research mission. This plan is a key element in our sustainability initiatives, and it involves many steps that will help us achieve our strategic goals as well as our climate commitment. It is also the right thing to do in a world of dwindling fossil fuel resources and worsening climate crisis.